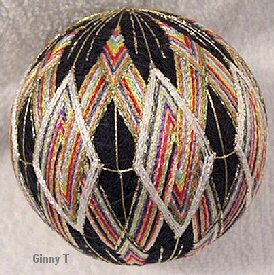 However, just because a design is centered around the middle of a temari, it does not always mean it can be called an obi. There is a definite perspective that guides the width of an obi - on anything, including kimono. Consider any example of traditional Japanese kimono, and look at the width of the obi in perspective to the length of the kimono as it's worn on the person (virtually all kimono are made alike in terms of size and length... length actually is adjusted to the person by folding excess and securing it in place with obi and related garments). The obi doesn't exceed about one-third of the height/ kimono length of the wearer. They may be narrower, but even in the most extreme examples of the obi on kimono of the Maiko in Kyoto (the most intricate and traditional kimono dress in Japan, still used today for first year Geisha in training), the width of the obi is one-third of the body length from ankle to shoulder. The use of obi design has of course, long carried over into the application of "middle" or obi designs on other many articles - be they functional or decorative, in almost limitless applications and art forms. 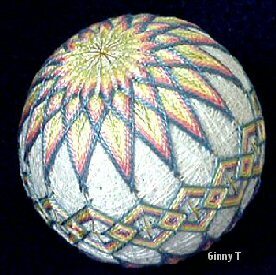 Applying this to temari, we can be guided for an equator design - that is, the design stitched around the middle of the mari, whether it's the main focus, embellishment, or part of the overall total temari. To be considered an obi, the maximum width of the obi design is one-third of the distance from top to bottom (north to south pole). To define this a bit further, the maximum width for an obi design would be 1/3 of the distance from north to south pole. (1/3 of 1/2 circumference). This is not to say that wider designs, centered around the equator, are "not allowed" or there is something "wrong" with them - nothing of the sort!! Wide designs are just that - wide (or tall/long) designs that circumscribe the mari, anchored around the equator. They can be and are effective and stunning. Wider designs would just not considered to be in artistic perspective to be called an obi, once they "overgrow" that 1/3 perspective. 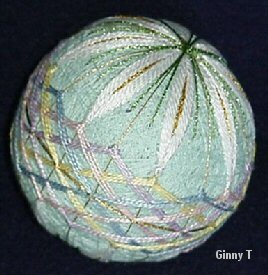 This is an example of a stitched, rather than wrapped, obi.